Referee Horacio Elizondo, who sent off England striker Wayne Rooney against Portugal, will take charge of the World Cup final between Italy and France. German Markus Merk and Slovakian Lubos Michel were the favourites to land the honour for Sunday's showdown in Berlin. But that responsibility will be given to the 42-year-old Argentine, who dismissed Rooney in the last eight for a stamp on defender Ricardo Carvalho. Elizondo was also in charge of the opener between Germany and Costa Rica. The physical education teacher has been a professional referee since 1994 and his first international was a game between Ecuador and Colombia in October 1996. Dario Garcia and Rodolfo Otero, also of Argentina, will be Elizondo's assistants. Japan's Toru Kamikawa will handle Saturday's third-place match between Germany and Portugal in Stuttgart. President of Fifa's World Cup organising committee, Lennart Johansson, agreed with the sporting body's president Sepp Blatter that referee Elizondo made the right decision by sending off Rooney. "I was at the game and I had a different opinion when I first saw the incident from the stands and then later on television," he said. "But having seen the replay, in my opinion he was absolutely right to send him off. "I also saw this referee in opening match and I did not notice him much which is a very good thing - much better than if you see a referee who says 'here comes the king of the road'." Elizondo showed David Beckham the red card when Manchester United were playing Mexican side Necaxa in the first game of the 2000 World Club Championship in Brazil. 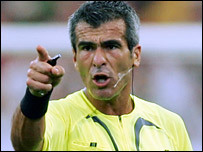 The Argentine has also officiated at the Olympic football tournament in 2004. Meanwhile, Germany World Cup-winning captain and coach Franz Beckenbauer has asked for there to be a crackdown on divers and cheaters. "The players are looking for an advantage and they attempt to exploit the situation," said the head of Germany's 2006 organising committee. "At the beginning of the tournament, I felt the referees were showing yellow cards too early for trivial offences but the players make it much harder by simulating, and by staying lying on the ground to interrupt play," he said. "Perhaps everyone - players, referees and administrators can get around a table after this to come up with a solution to put an end to this kind of unfortunate incidents. Beckenbauer also wants any player cautioned who tries to get another player booked or sent off by waving an imaginary card at a match official. "This is unsporting and unfair," said Beckenbauer. "I think that whoever asks a referee to give a yellow or red card to another player should get the card himself."